Nikon School and Create Away are excited to bring you the Camargue Wildlife Experience – a bucket-list experience! On this 6-day workshop you will join a Nikon School expert and professional photographer Serge Krouglikoff in the Camargue for a week of exciting wildlife photography including the famous Wild White Horses; white and black stallions, pink flamingos and black Camargue bulls. On top of the exciting photo shoots, you will benefit from daily masterclass sessions with the Nikon School expert for a complete package guaranteed not only to thrill but also improve your photography skills at the same time. Collection from Montpellier airport for transfer to your charming hotel in the centre of Aigues-Mortes. Welcome drink & briefing meeting with the Nikon Trainer and Serge Krouglikoff. We spend a day at the Parc Ornithologique, which is a natural Camargue wetlands area of great importance. Accompanied by Thierry Vezon, BBC Wildlife bird specialist, Thierry will guide you to the prime locations among the waterways and lakes to capture a wide variety of species in one of the largest arrays of birdlife in Europe, from single birds perched at the nest to large flocks of pink Flamingos. The Nikon Trainer will host a masterclass session on how to capture wildlife in action. At dawn, we head to the beach to photograph the black stallion running along the white sand and in and out of the sea. Masterclass session plus critique & review of your photos. In the afternoon, we witness the Black Camargue bulls thundering through the shallow waters of marshland, their horns held high, as they are herded by the Gardians on horseback. We head to the beach for a shoot with a beautiful white stallion. 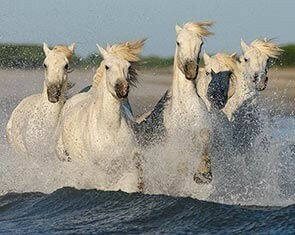 In the afternoon, we photograph the Wild White horses running through marshes and also take shots of the ‘Gardians’ (Camargue Cowboys) dressed in their traditional Camargue shirts & hats, trident in hand, surrounded by the herd, as well as some close-up portraits of these ‘weathered’ ranchers. 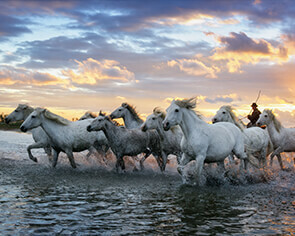 At sunrise, we photograph the horses splashing through the shallow waters of a marsh in a new location. We will also capture the ‘Gardians’ at work herding the wild horses. Late afternoon, we head back to the beach for the ultimate spectacle of the wild horses running along the golden sand and through the surf with sea spray flying! • Group dinner at typical Camargue restaurant with Flamenco music (optional). At dawn, we photograph Wild White horse stallions fighting. Time permitting, wrap session critique and review before departures to the airport.